How much damage did the fire do to Julio Iglesias' villa in Ojen? The house of Julio Iglesias, that is located in Ojen, where the big wildfire started last Thursday, remained safe, only the garden was damaged. Two years ago the global music star Julio Iglesias married his partner of 20 years, Dutch model Miranda Rijnsburger, and they chose the quaint Andalusian setting of Ojén to call one of their homes. Little did they know that there will big a big wildfire in that area. The fire started on Thursday afternoon in the Sierra Negra area of Coin and has now affected an area of 5,000 hectares. It also cut part of the AP-7 highway and it is not known yet how many homes have been damaged or destroyed. Overnight the fire spread rapidly because of the wind through a 12km coastal strip that is packed with holiday homes. At the moment altogether over 5000 people have been evacuated in Ojen, Mijas, Alhaurin el Grande, Coin and Marbella. 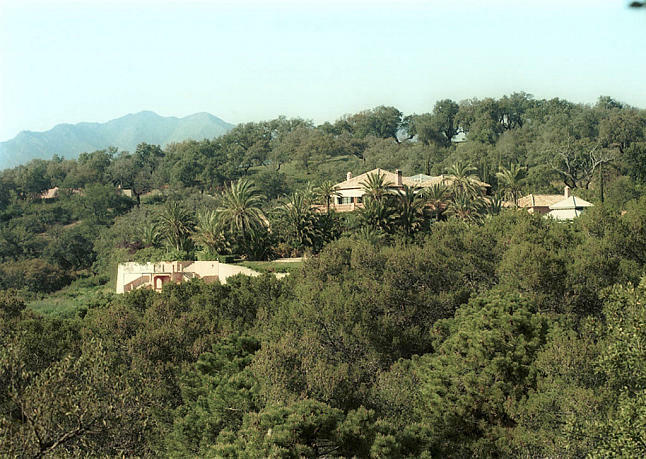 According to andaluz.tv who travelled the route of the fire, from La Mairena to Ojén, everything was burnt on the small gravel road alongside the house of Julio Iglesias. One Russian neighbour of Julio said that though everything was burnt, the singer's house had not been damaged, only the garden had been. One other neighbour of Julio was not so lucky, because the house and two cars were completely burnt out. The good new is that on the road to Ojén there had not been damages to houses and cars. No comments on the death of any animals which we know there have been many due to the horrendous fires? Like dogs on chains which owners did not let/cut loose before fleeing off themselves.....just incredible!